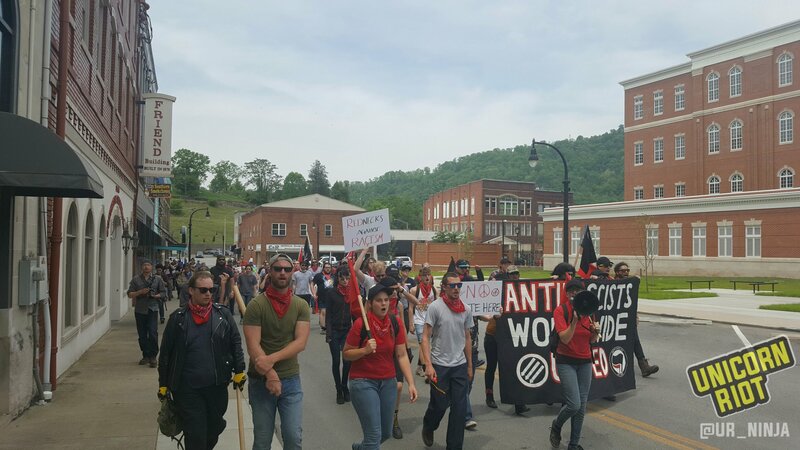 Pikeville, KY – On Saturday, April 29 a coalition of white supremacists calling themselves the Nationalist Front held a small rally in front of the old courthouse in downtown Pikeville. The rally was the public component of a gathering where various established white nationalist/neo-Nazi organizations had gathered to hold workshops on private land in the area. The days leading up to the event were tense as anti-racist organizers had vowed to confront any white nationalists who came to Pikeville. Unicorn Riot was live to cover the confrontation. Both sides as well as many observers expected a violent clash along the lines of recent events in Berkeley, CA on April 19. 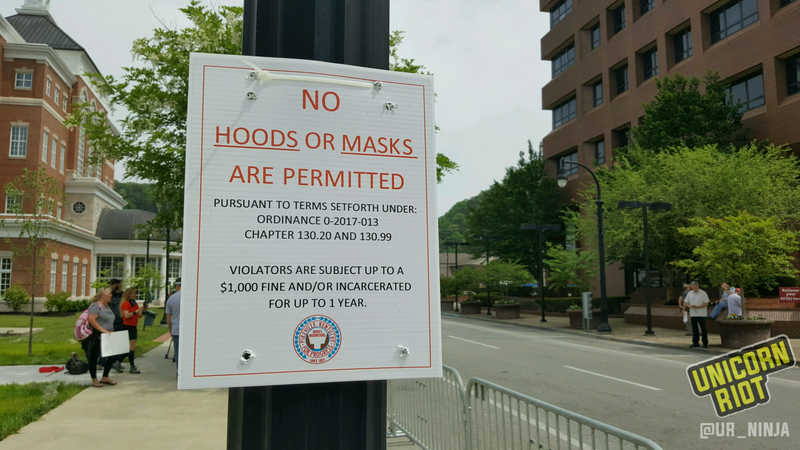 The city of Pikeville passed an emergency ordinance days before the scheduled rally banning the wearing of all masks and hoods. A sign was posted up in the center of the planned rally space. Local residents of Pike County and visitors from out of state started assembling in various points downtown. A woman who identified herself as a mother against racism in Appalachia wanted to make a statement to the press, but didn’t want to show her face on camera because of fear of being targeted by the hate groups converging that day. 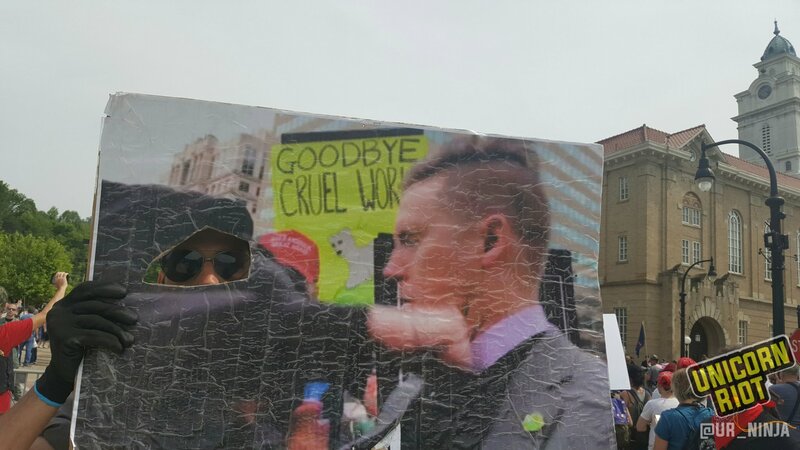 One person attending the counter demonstration brought a “your face here” poster so others could commemorate themselves in the ongoing meme of Richard Spencer being punched in the face on Trump’s Inauguration day in Washington, DC on January 20. While the Traditionalist Worker Party (TWP) and the National Socialist Movement (NSM) had called for the rally to begin at 2 PM, their caravan did not arrive until about an hour later. Unicorn Riot later received information that this was due to TWP and NSM organizers getting lost and being unable to navigate to Pikeville from their campsite, reportedly stopping their caravan of dozens of vehicles on the side of the road several times. A convoy of TWP and NSM members and supporters, all white and almost entirely male, arrived around 3 PM. TWP leader Matthew Heimbach herded the small crowd of racists, some of whom held shields, into a line formation. They then promptly marched into the fenced-off space the police had created for their safety. After he arrived, we were able to ask Matthew Heimbach some questions about his views on race and his national socialist ideology. As the Nazi rally wore on, we spoke with some Pikeville residents who came out to oppose the white supremacists. Later, we were able to ask Matt Heimbach about his group’s arrival leading to local businesses closing, desite his claim to advocate for working class people in Pikeville. He blamed “left wing violence.” When we asked him to clarify, he walked away. As the group of neo-Nazis started to return to their cars, counter-protesters mocked them as they left. 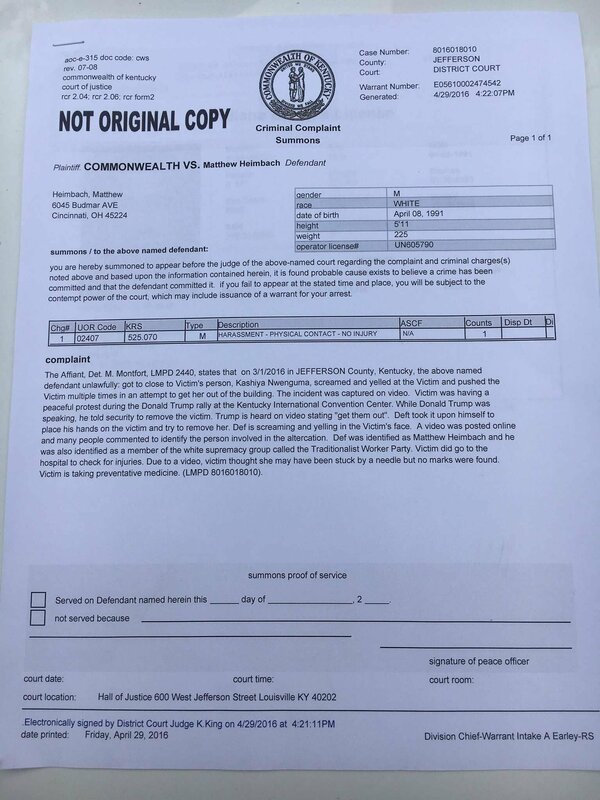 As Matthew Heimbach was leaving, police served him with a court summons stemming from his assault of a black woman who was protesting at a Donald Trump campaign rally in Kentucky in March 2016. 2 antifascist/antiracist protesters were arrested immediately after the demonstration and were released on bond early the next day. As the Nazis started to get their cars to leave, a large, previously unseen formation of Kentucky State Police showed up to guard their exit route.